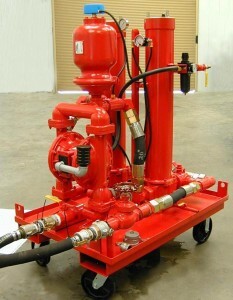 MB Fluid Services offers both vacuum dehydration for water separation and particle filtration units used for many applications including preventative maintenance and emergency services. These units were built and designed by Shell Lubricants and are now owned and operated by MB Fluid Services to meet your entire request in extending the life of your lubricants and equipment. If you are experiencing moisture concerns then our Vacuum Dehydration units can assist you in the removal water from lubricants. 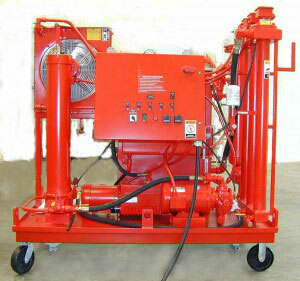 When moisture is found within hydraulic oil it can result in various hydraulic problems. Contamination is the single largest contributor to hydraulic component failures and should not be underestimated. Water contained in oil initiates rusting of metals by adhering itself to the metal surface, this in turn decreases the life of this equipment and increases the chance of other solid particulates to form and further contaminate the lubricating system. When rust is released into oils it acts as catalysts to accelerate oxidation reaction of oils, i.e., presence of water makes oxidation rate by a few tens to a few hundreds of times. To solve this problem, we use technologies developed by Shell Lubricants that will separate the water from many types of lubricants. Removal of trace moisture dissolved air & entrapped gasses from oil. It prevents loss of oil yielding and provides 100% recovery after dehydration. Environmentally safe and friendly process since no chemical reaction is involved. Maintains the properties of liquid that are being cleaned. In most cases MB Fluid Services can process lubricants on-site assuring uninterrupted production process.